A ketogenic diet is one in which the body predominantly uses ketone bodies for fuel. This may look like 70 to 80% fat, 15 to 25% protein, and 5 to 10% of calories coming from carbohydrates. Some people following a ketogenic diet try to stay under 20 grams total of carbohydrates per day, others choose to stay under 20 grams of net carbs per day, and some (depending on how long they have been in ketosis and the amount of their energy expenditure) are able to stay in a ketogenic state taking in more carbohydrates. Also, some people take exogenous ketones which help put them back into a ketosis if they’ve kicked themselves out by consuming too many carbohydrates. Why do I need to limit my carbohydrates on a ketogenic diet? If you do not limit your carbohydrates, your body will use glucose instead of fat for its main source of fuel. On a ketogenic diet, we restrict carbohydrates so our bodies must use fat as fuel. It does this in the liver by breaking down fats into ketone bodies, which are then used as fuel. Why do I have to limit my protein intake on a ketogenic diet? If you consume too much protein on a ketogenic diet, your body may have an insulin response. This process inhibits the body’s ability to produce ketone bodies. The amount to which you need to limit your protein varies person to person and depends on many factors just like carbohydrates. 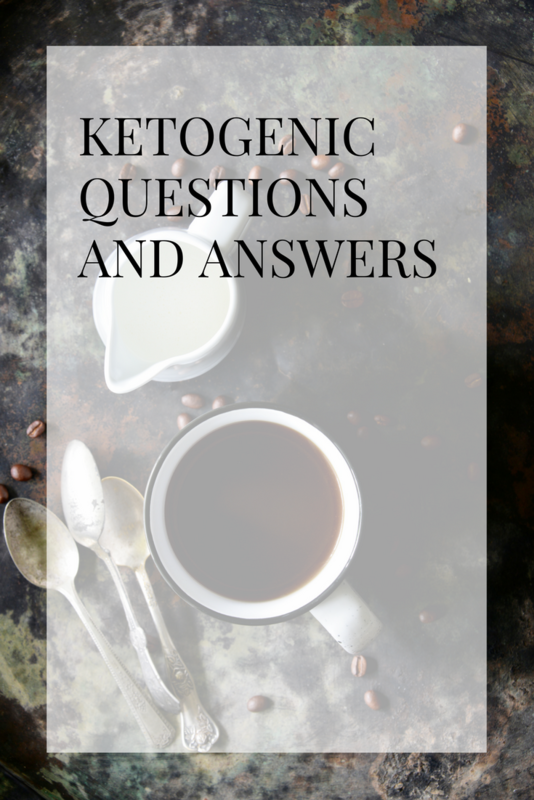 What types of fat should I be eating on a ketogenic diet? Good sources of fat on a ketogenic diet include coconut oil (because it’s high in medium chain triglycerides C8, C10, and C12), extra-virgin olive oil, avocado oil, grass-fed butter, clarified butter, ghee, tallow, olives, walnuts, coconut, bacon, and bacon fat. Most of these are saturated, and they are less likely to be oxidized when cooked. Extra-virgin olive oil should be used on salads or in areas where it will not be cooked, as it is oxidized more easily. Avocado oil has a higher smoking point so it can be used with cooking. Quality of fats is extremely important because when fats are oxidized (meaning when they are heated to a certain temperature and they produce oxygen-reactive species) they can form free radicals that can oxidize LDL cholesterol, which in turn can damage our arteries’ lining and cause hardening of the arteries. Net carbs are total number of carbohydrates minus fiber minus sugar alcohols. Exogenous ketones are ketones that are ingested, meaning they were made outside the body. Endogenous ketones are foods that are high in medium chain triglycerides and when ingested, the body will produce ketone bodies in the liver. Medium chain triglycerides (like coconut oil, palm kernel oil, and dairy) contain 6-12 carbon atoms. The liver rapidly breaks MCTs down for energy or turns them into ketones, making them less likely for the body to store as fat. What is fasting or intermittent fasting? Fasting means going without food certain for amount of time; intermittent fasting is usually done for a 16 hour period with an 8 hour feeding window. In most cases, people decide to have their eating window from 12 p.m. to 8 p.m. with no eating from 8 p.m. to 12 p.m. While fasting, some people consume some type of fat about 30 minutes after waking, such as coffee with heavy whipping cream, MCT oil, MCT oil powder, or clarified butter. Consuming these foods allows them to stay in a fasting state because they don’t produce an insulin response, meaning they are still using ketone bodies predominantly for fuel. People may also choose to consume tea, coffee, and bone broth during a fasting state.